Translation:We ate ten bowls of beef noodles, we are so full! should also accept "really full"
"We ate ten bowls of beef noodles. We are really full!" is accepted now. Should also accept "we've eaten"
I answered "We ate ten bowls of beef noodles, really full!" and got it wrong because I didn't write "we're really full!" I realize this quiz cannot anticipate all possible answers, but my answer should have been scored as correct. Aside from comma-separated sentences being bad English grammar, I don't think any native English speaker would ordinarily say "Really full!" (with an implied subject) in place of "We're really full!" Have you read our president's tweets? We might need a new Duolingo course: Trumpese for English speakers. I think the sentences should match. The Chinese has two clauses separated by a comma but the English has the two clauses in two separate sentences. I get that the subject "我們" is implied for the “真飽”, but it's not a good way to write the sentence for learners. I never know what they mean by the commas between ideas. In English a period is used to separate sentences, but here the comma can be a "and" or "so" or it can be a full stop. Can someone explain? I'm no expert in Chinese, but I lived and taught in China for a number of years. In nearly all of the texts I have received (written in Mandarin) from my Chinese friends, they have used commas simply to separate ideas in a sentence rather than to join clauses as we do in English. So, the sentence as written in this exercise seems perfectly normal to me even though it would take some additional words to translate it correctly into English. In English you need a conjunction, a semi colon or a colon to join two independent clauses, not a comma. Either that or you just have two separate sentences. However using a comma seems to be normal in Chinese judging by these Duo exercises. Using just a comma to join two independent clauses in English is called a comma splice and is grammatically incorrect, although people often use the equivalent structure in conversation because in conversation people often do not care about sentence structure. "We ate ten bowls of beef noodles, and are really full" seems like it should be the correct translation. Am I wrong in thinking it is incorrect to take a single sentence in Chinese and separate it into two sentences? The point of sentence separation is to partition ideas. If ideas belong together (i.e. are a single sentence) in one language, then they should be together in another language - you just need to adapt the exact phrasing to allow for grammatical differences. Translation cannot always be clearly 1-1, but it should at least be isomorphic (i.e. after translating one way should be possible to translate back and get the original as one of the possible options). You are wrong in fact. Different languages have different ideas of what can go into a single sentence. This is the case with Chinese versus English. But your translation is still a good one. So are ones with "and are really full" and "and we're really full". 'So full' should be sufficient in conversation. I've surely seen beef noodle soup on the menu. Have eaten is not wrong choose. More correct than ate. Really full is more correct than so full. "Have eaten" and "ate" are equally correct. "Really" full seems better to me than "so full" which I would write as 太飽了. Why can't "we've eaten" be accepted? I would've thought present perfect would be more appropriate in this translation. For me, present perfect and simple past are equally appropriate. Should accept ”beef noodle soup” as well. I don't think you can have 有 at the end like this. I think it should be 你吃了吗？or 你吃不吃了？but you're right that 了indicates a continued action that has come to an end. The 'correct translation' is 100% incorrect. 'We are so full' clearly indicates that the past action has a direct effect on the present, which is a definition of present perfect tense. Therefore, an actual correct traslation is 'we have eaten ten bowls of beef noodles, we are so full', there is no use for a past tense. There are no tenses in Chinese, just aspects; so one could pick "We ate…" or "We have eaten…" and it doesn't really matter since the sentence is only conveying that eating has been completed. 1) Is "beef noodle soup" accepted? If not, do you think it should be? 2) is "really filling" accepted? If not, do you think it should be? 1) The Chinese 湯 is something close to a broth. It doesn't have many ingredients in it usually, and is often used as an appetizer rather than a full meal. 麵 can be just noodles (乾麵, literally "dry noodles") or actually a soup in our perception. Here is 玉米湯, corn soup, a popular appetizer. 2) OK I guess yes, 飽 characterizes a feeling of a person/animal, not the food. 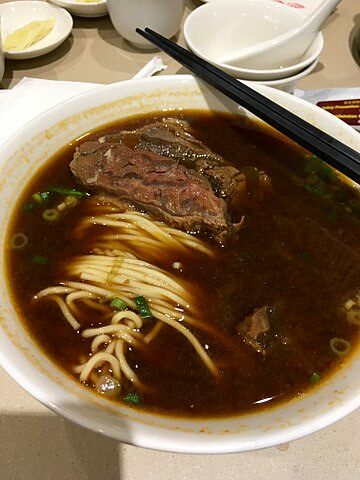 Don't get me wrong: I understand that 牛肉面 is noodles with beef broth (and if you're lucky there may actually be some pieces of meat in it 哈哈). My point was trying to make sense of how the Duolingo authors translated it, that's all. They wouldn't accept "soup" because there was no 汤 in the sentence. Aah, I see :) In that case I hope they stumble upon my report or this comment thread and see that 牛肉面 is called "beef noodle soup" in English and add this translation :) Thanks! I don't agree with the translation 'so'. They must be Sumo wrestlers to pack down all that chow. For "so full", aren't we supposed to use "太饱了" ? That was a lesson a long time ago. So with "真", we don't need "了"? I just suggested they add "We ate ten bowls of beef noodles and we're really full". If I heard someone say this I wouldn't assume the speaker wanted to include all of his/her beef noodle eating friends in the 真饱 sentiment; couldn't this also be "I'm so/really full"? It's actually been out of beta for months now. So use your computer or speech recognition. I use all three interchangeably.